Forex 101 is a Forex education company that was established to help many aspiring traders learn easy, stress-free and simple techniques on how to trade the markets profitably. Being apart of your signal group has helped so much not just in sense of profits but on my own behalf when I Analyse and place a trade then I see you give a signal and I’m already init. It also has mentally helped me with the calmness behind trading and letting my trade play out , instead of checking every couple seconds or minute so not only do I get to gain profits , I’ve become more mature towards my trades . Nov 18, 2018 - 5 Stars I just started not so long ago and I’ve picked it up soo quick , makes trading feel simple. Thanks Joe do appreciate your commitment. Best and transparent educational resource second to none. Good analytical and technicall price action capabilities. Joe is the real deal. 100% recommend forex101 to anyone looking for a great education. Joe has the best webinars! If you happen to stumble across Joe like i have, consider yourself lucky. Truly life changing how he can lay out a path to freedom. Very rare to have access to this information. Get on it! The man is a an absolute champ. The amount of knowledge he provides especially on his webinars is ridiculous especially being free. If your a newbie to forex I would recommend him as a great person to learn from. Excellent Risk to reward and risk management explained. Would HIGHLY recommend FOREX101 to ANYONE interested in learning how to trade forex! Forex101 is such a great company, I was introduced earlier this year and after months of studying, i had a an "ah ha" moment and everything clicked. I am incredibly grateful for Joe and Andrew they have ALWAYS helped me no matter how big or small no matter what time it may be, they're always there to help! did i mention they do it all for free? One of the little real traders out there who do it for the love of helping others better themselves! Cant thank you Forex101 enough!!! Highly recommended! Amazing Group strictly focused on improving their trading! Its rare to find a professional trader who is willing to provide free education and is contactable any time. Joe fast tracks the learning process by keeping it simple yet effective. Highly recommend anyone to join in on the weekly webinars to watch live analysis from a great trader. 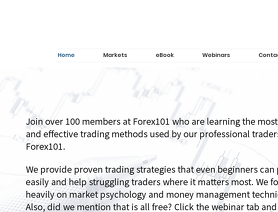 For anyone wanting to either commence their journey or refine their skills at trading, look no further than Joe @ Forex101. Entering the market as a technical trader can be very overwhelming with all the tools available. Joe has a very simple and authentic approach to teaching people. You can forget the flashy cars, watches and stacks of cash when working with Joe as he gives real-time experience. Always accessible, he is determined to teach people a way of owning their own outcomes without rushing in. I can't recommend Forex101 enough..
Joe, the man behind Forex 101 wished he had a community and mentor when he first started out. That's his motivation behind starting Forex 101, where he is active on a group chat, hosts live webinars multiple times a week (recordings then posted online), and even has the occasional seminar. All of this is free because he genuinely just wants to give back! The system he teaches is easy to follow and implement. As a new trader who works full time and is practice trading, his system is perfect for me. Added bonus: I'm already seeing my account grow!